Truckloads of dirt is added to the stadium floor, specifically for all four events that take place within this 30 days – Monster Jam, AMA Supercross, PBR & THE AMERICAN. That’s a lot o’ dirt! 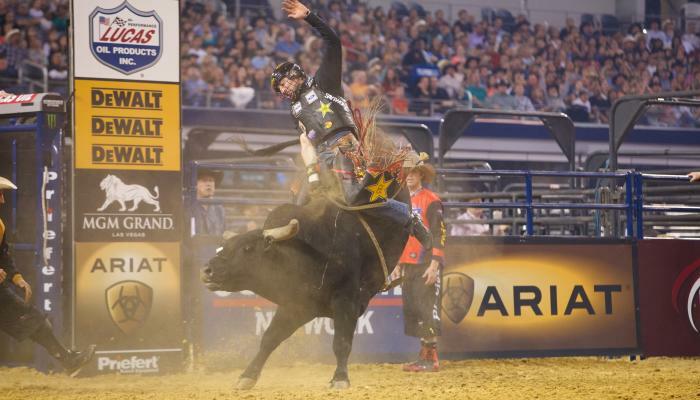 Bull Rider Mike Lee has over 500 8-second rides, while Brazilian rider Guilherme Marchi is honing in on 600 8-second rides! We’ve got ourselves a true-blue ropin’ and ridin’ cowboy! The PBR Iron Cowboy Major, part of the Built Ford Tough Series, is the largest single-day event for the organization annually. Second to the 5-day World Finals event that takes place in Las Vegas annually. With headquarters in Australia, Mexico, Canada and of course the USA, riders represent each of these countries during the competition, including riders from Brazil. Eighty-two contestants have been invited to compete at THE AMERICAN. Of those 82, 31 are current or former world champions. They represent a total of 90 world championships in the Professional Rodeo Cowboys Association, the Elite Rodeo Association, the Women’s Professional Rodeo Association and the Professional Bull Riders to their collective credit. At the end of this year’s THE AMERICAN rodeo contestants will have left AT&T stadium with more than $8 million in cash and prizes in the past four years. THE AMERICAN has the richest purse in the rodeo business – a staggering $2 million to giveaway to winners each event. This has been going on for four years at AT&T Stadium, you do the math. Sign us up! THE AMERICAN requires two full-size rodeo arenas, plus dirt for the livestock areas, which the PBR also uses. While bull riding generally does not require as much dirt as rodeo, the PBR adjusts to the varying sizes of its venues. THE AMERICAN will provide approximately 150 head of livestock – bucking horses, bulls, calves and steers – for the competition. Timed event contestants will bring nearly 100 highly-trained performance horses to compete in Arlington. From 12-year-old Chanyi Chamberlain to 68-year-old world champion Mary Burger, the age gap is pretty impressive! The rodeo performance offers more than four hours of non-stop entertainment for fans, offering lots of bang for the entertainment buck. No one can complain about saving some cash, or having their attention span entertained for that long!